People who suffer from migraines know how debilitating they are. According to the Migraine Research Foundation, migraines affect 38 million men, women and children in the U.S. and one billion individuals worldwide. Each individual affected by migraines often experience their own unique set of triggers and do their best to avoid them. Those triggers can include anything from dehydration to strong smells. Exposure to triggers such as a particular perfume or artificial sweeteners can be reduced or completely avoided by staying alert to what is around you and documenting each trigger. Some triggers, however, are harder to avoid, such as changes in weather. Often people assume they are suffering from a simple “sinus headache” when in fact they are actually suffering from migraines related to changes in weather. A large population-based study found that many people who were diagnosed with a migraine thought they were experiencing a sinus headache. In fact, migraine is commonly misdiagnosed as a simple “sinus” headache. The study also found that 88 percent of the participants were found to be suffering from migraines and not sinus headaches. A true sinus headache is rare, and primarily related to a viral or bacterial sinus infection that can often include facial pain or pressure, which can mimic migraine pain. Someone who suffers from migraines triggered by weather can experience warning signs as early as 48 hours prior to the actual migraine onset. Symptoms can include irritability, depression, excitability, and excessive yawning. Meanwhile, exposure to weather-related triggers can tip a bad headache into a full-blown migraine. Low barometric pressure has been known to be a migraine trigger due to the pressure exerted by the weight of the atmosphere. Some believe barometric pressure changes might affect the pressure in the brain or the way the brain blocks pain. For others, weather changes can cause imbalances in brain chemicals, such as serotonin, which can result in a migraine. A drop in barometric pressure usually accompanies cloudiness, wind, precipitation, and thunderstorms. There is also a theory in which the blood vessels in the head expand and contract to compensate for the changes in oxygen levels which are accompanied with the changes in barometric pressure. 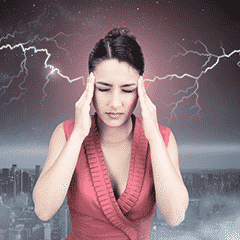 For others, the extreme brightness of lightning can spark a migraine. In a 2013 study, it was determined there was a 28 percent increased chance of a migraine and a 31 percent chance of a non-migraine headache on days when lightning struck nearby. The study also looked at the specific electrical charge that a bolt of lightning carries and found that negatively-charged lightning strikes had a particularly strong association with migraines. While individuals who suffer from migraines triggered by weather cannot control the weather causing them, there are steps a migraine patient can take to help reduce the severity. Journal: Keep a migraine journal to better identify your specific triggers. Make sure to include information about the temperature, humidity level, and barometric pressure to help determine if weather is a true migraine trigger for you. Make sure to also take note of the symptoms of the migraine, such as nausea, sensitivity to light, and from where the pain emanates and how it feels (sharp, throbbing, etc.). Drink a lot of water: While proper hydration is recommended to everyone, it can especially help migraine sufferers. Good hydration can help to lessen the pain from high humidity and extremely dry weather. Avoid beverages such as wine, which is another common migraine trigger. Purchase a barometer or use an app: If barometric pressure is believed to be a trigger, a barometer can help identify the range of pressure that causes pain. Using an app on a smartphone can help track the specific area you are in at any time. Consider tinted lenses: Some migraine sufferers find that sunglasses in different tints can provide pain relief and reduce the discomfort of specific visual stimuli. There is a belief that excessive brain activity can induce a migraine. Sunglasses with tints specifically for migraines may help to normalize brain activity and reduce visual stress. Avoid non-weather-related triggers: If bad weather is on its way, make sure to avoid other triggers to try to reduce pain levels. Go inside: Stay indoors if possible when bad weather is on the way. You can better manage temperature and humidity when inside. If issues with light come with a weather-induced migraine, make sure to close the blinds or curtains to try to keep painful light as dim as possible. Consider migraine control methods other than medication: Research on how to help migraine sufferers is moving forward at an amazing pace. For many, traditional migraine medications do not always work or have side effects that are difficult to manage. A technology that is helping migraine patients is The Reed Procedure. This treatment uses peripheral nerve stimulation specifically for the treatment of chronic, severe headaches using occipital and supraorbital nerve stimulation. It has been proven to have a high success rate (more than 80 percent) for patients suffering from severe migraine headaches. Rainy weather or high humidity can evoke a variety of different issues and moods. Many prefer to stay in bed and sleep when it rains, but it has nothing to do with trying to hide from migraine pain. For others, however, there is no hiding from the searing pain caused by a weather-induced migraine. By keeping track of triggers, and working to control the ones that can be controlled, migraine sufferers can suffer just a little bit less. Reed Migraine Centers - Founders and Inventors of the Omega Procedure | Reed Procedure | 4-Lead Procedure | » How are Migraines Triggered by Weather?